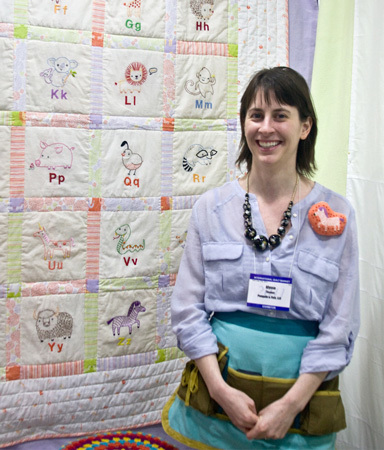 The Fat Quarter Shop is excited to welcome Alyssa Thomas of Penguin & Fish to the Jolly Jabber. 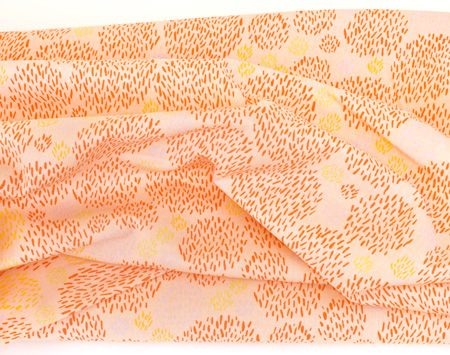 Alyssa’s latest fabric collection is Safari Sweet Organic from Clothworks. Q: What was the first seed that grew into the Safari Sweet Organic collection? A: I love drawing little animals. What I love even more is turning them into embroideries. The inspiration for Safari Sweet came from a series of those embroideries (as shown above), one animal embroidery for each letter of the alphabet. Q: What are 3 words you would choose to describe this collection? Q: What single print/SKU in the collection is your favorite (can only pick one!)? A: I love all the little animals but for some reason I keep going back to the coral-red grassy dot pattern. It's fun and simple but still has a ton of character. And I love the color! Q: What is your dream project using this collection? A: I want to cut out the characters from the large animal print and sew them into little plush toys. Barrels and barrels of them! 1. What music are you listening to right now? I'm much more of a Hulu watcher, but give me some 80's rock and I'll be ready to work for hours. 2. What is your guilty pleasure food? 3. Where did you grow up and where do you call home? Grew up in Fond du Lac, Wisconsin. Now I live in Minneapolis, Minnesota. 4. Your biggest pet peeve? Going to bed too late. 5. What is your favorite fabric print ever (excluding your own)? Ooo, difficult question. Show me anything by Tammis Keefe and I'll be squealing.